One of the most frustrating things this past week has been watching James Comey make the rounds of Stephanopoulos, Maddow, follow site The View, along with other outlets and be lauded as some paragon of moral rectitude and virtue. Jim Comey is a lifelong Republican who vardenafil senza ricetta Veneto willingly and enthusiastically signed off on Torture (a War Crime in case you’ve forgotten) and who, http://thefoolishobsession.com/tag/vaucluse/ immediately after his oh so so brave and principled stand at the bedside of John Ashcroft, long term use side effects prednisone personally approved a omprare viagra generico 25 mg consegna rapida a Bologna barely modified program of blanket electronic surveillance on United States Citizens THAT PERSISTS TO THIS DAY! Oh, and because of his “credibility” he’s as responsible as any single person except Hillary Clinton and her pathetic team of overpaid and ineffectual crony campaign consultants for Donald John Trump’s unexpected victory. Yep, more than Vladimir Putin. He is, unfortunately, a Deep State piece of slime, just as Donald Trump describes him which does not make Donald Trump any less loathsome or guilty either. Of all the hagiographic interviews the one that came closest to holding Comey’s feet to the fire as they deserve to be is Stephen Colbert who at least made him aware that Stephen knew about his record and wasn’t buying everything Comey was peddling. That awkward sip of Pinot in the middle? That was Stephen letting Comey know he was see made. How do you go from being a government hack to a progressive hero? It’s easy: Get fired by Donald Trump. From FBI Director James Comey to Secretary of State Rex Tillerson to Veteran’s Affairs chief David Shulkin, it turns out there’s no surer route to redemption among liberals than a “You’re fired!” from President Trump. Even better if it comes via tweet. But perhaps the most shocking example is the curious case of James Comey. After Hillary’s loss, it was even worse. “Donald Trump owes him a big thank you” said Nicholas Kristof of the New York Times. Democrats far and wide follow site blamed Hillary Clinton’s election debacle on Comey. 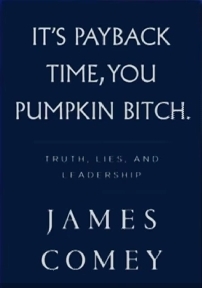 Today, Comey’s book— A Higher Loyalty— Truth, Lies, and Leadership – is on the best-seller list before it’s even been released; He’s scheduled to be feted on the Left’s favorite cable news shows; and enthusiastic partisans are when will levitra go generic paying up to $850 a ticket to see him on his book tour. It’s as if Newt Gingrich suddenly became the golden boy of MSNBC. How did it happen? He’s the ultimate EOT: He was fired by Trump in the midst of the RussiaGate scandal and then leaked information to wage war on the White House. The anti-Trump trifecta. There are more examples. Notorious “neocon” Bill Kristol of the Weekly Standard, once hated for promoting the Bush Doctrine in Afghanistan and Iraq, is now a liberal darling for leading the #NeverTrump movement. Mitt Romney, once smeared by Democrats as a misogynist with “binders full of women,” is now the responsible GOP good guy they can respect, etc. etc. What it all points to is the political gravitational pull of the Trump presidency. Every policy and (especially) every person is measured by their relationship to Donald Trump. Simply being Trump’s enemy can suddenly make you every Democrats’ best friend. During his half-century spent defending Americans’ civil liberties, here’s what has changed, according to lawyer Alan Dershowitz: “Now conservatives have become civil libertarians, and liberals have become strong supporters of law enforcement, the Justice Department and the FBI,” the professor and pundit said after dining with President Donald Trump last week. That snorting sound you hear? That’s a thousand libertarians shooting coffee through their noses at the notion that the GOP is newly sympathetic to issues of law enforcement overreach and intrusive investigative tools. Republicans had an opportunity as recently as three months ago to rein in warrantless snooping under the Foreign Intelligence Surveillance Act. What did they do? They voted overwhelmingly to reauthorize the practice for another six years: 191-45 among GOP members in the House, 43-7 in the Senate. It’s unfortunate how wrong Dershowitz is about the Republican Party. But what’s also depressing is that he may be right about the Democrats. In their efforts to oust a potentially lawless president, they are exalting a rogue’s gallery of surveillance-state officials who have abused their power. But as Schiff certainly knows through his work on the House intelligence committee, Clapper straight-up lied to Congress and the American people in March 2013 when asked by Sen. Ron Wyden (D-Ore.) whether the National Security Agency collects “any type of data at all” on millions of Americans. “No sir. Not wittingly,” Clapper replied. Three months later, after the revelations of phone logs and email data collected by the NSA made front pages, Clapper characterized his lame answer as the “least untruthful” way he felt he could respond. If Trump and his B-movie gang of hangers-on are eventually to be tripped up on a series of lying and obstruction-style charges, surely there are better character witnesses for the prosecution than a perjurer. It’s difficult these days to get the latest #resistance news without encountering some of Clapper’s partners in government malfeasance. One of MSNBC’s latest contributor hires, for example, is former Obama-administration CIA Director John Brennan. Like former FBI director James B. Comey, Brennan is one of the more melodramatic voices on Twitter, delivering stern lectures to a presidential interloper who dares impugn our noble intelligence state. By uncritically cheering on such flawed actors, the Trump opposition is sending a clear if unwitting message to future abusers of power: To rehabilitate your image, simply oppose the president with enough flowery adjectives. I predict we will hear more such performances — complete with applause from progressives — during the upcoming book tours of Comey and former CIA Director Michael Hayden. To the extent that these former officials have direct knowledge of matters relevant to the Trump/Russia investigation — and Comey, at least, certainly does — we need to hear from them. But if in these fraught political times we’re taking our moral cues from a gang of former intelligence officials, then our problems run deeper than — and will outlast — the current resident of 1600 Pennsylvania Ave.
Now I come from an entirely different direction, the Libertarian Left. I’m an Anarcho-Syndicalist and a Populist of the non-racist/nativist type, an inclusive small “d” democrat. But these people aren’t wrong.